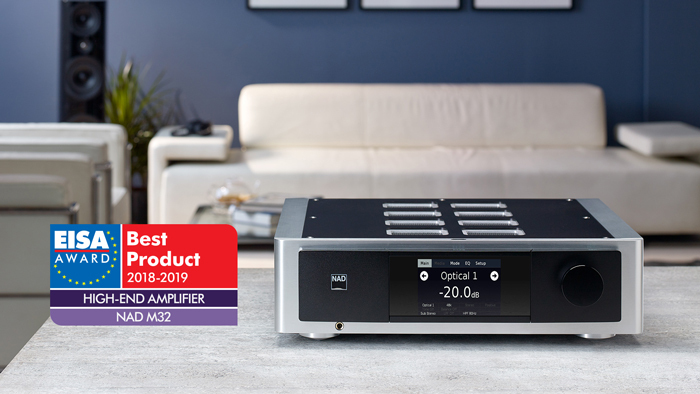 We are delighted to announce the M32 DirectDigital™ Integrated Amplifier from NAD’s flagship Masters line of products has won the 2018/19 EISA Award for Best High End Amplifier. We will be accepting the award during the EISA Awards ceremony, scheduled to take place during IFA in Berlin, Germany, on August 31, 2018. EISA, the European Imaging and Sound Association, is an independent body of over 50 specialist interest magazines around the world. The award winners are chosen as the best in their category from the thousands of products tested and reviewed by EISA member magazines over the year. The NAD Masters M32 and its innovative Class D amplifier design and streaming capabilities through the built-in BluOS® system led its class in performance, connectivity and flexibility. The M32 DirectDigital Integrated Amplifier is NAD Masters’ flagship integrated amplifier, available at select premium audio retailers around the world.